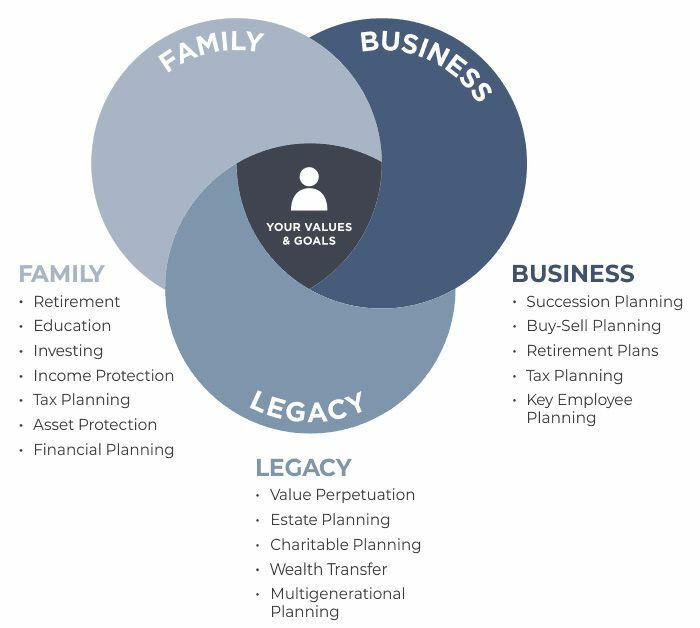 Strategic and coordinated insurance solutions for individuals, families and businesses relating to personal, estate and business planning needs. Our multi-disciplinary team has decades of collective experience. In addition to managing assets in the public financial markets, we also offer real estate and private equity investments to clients for diversification and yield enhancement. Our collective, hands-on approach to wealth management provides our clients with an array of in-house, multi-disciplinary services that deliver creative, integrated solutions. We provide personalized financial advice from experts in their fields – not one-sized-fits-all plans. We know that your wealth is uniquely yours and no one knows your family, business, or organization like you do. Our process is to partner with you to create and implement holistic wealth management strategies that grow, preserve and transfer your wealth in alignment with your goals. As a client, you’re a trusted friend and partner. We believe it is important to develop personal, lasting relationships. We dedicate a team of senior principals to each client to give you direct access to advisors who can personally evaluate any financial need.